Two bands, each with a heritage-based theme and playing a similar form of black metal, makes for a good idea for a split, right? Right? Well, up to a point. Limited to 666 copies on vinyl, because Satan (but also available digitally, because money) and featuring three tracks from Drudkh and one from Winterfylleth, each of the songs here is a cover version. Drudkh pay homage to Hefeystos, Unclean, and Sacrilegium (none of which I'd previously heard of but which hail from Poland, Czech Republic and Poland respectively and all play various forms of black metal, as if it needed to be said) and Winterfylleth cover Hate Forest, the forerunner to Drudkh and Blood of Kingu with several members from them including Roman Saenko (which seems unnecessarily arse-kissingly respectful to me...). 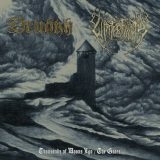 Definitely a win for Drudkh, then, and those who miss out on the exclusivity (these 666 copies will fly out quickly) will be relieved to hear that the Drudkh songs will also appear on their forthcoming rarities collection Eastern Frontier in Flames, a review of which is also forthcoming!